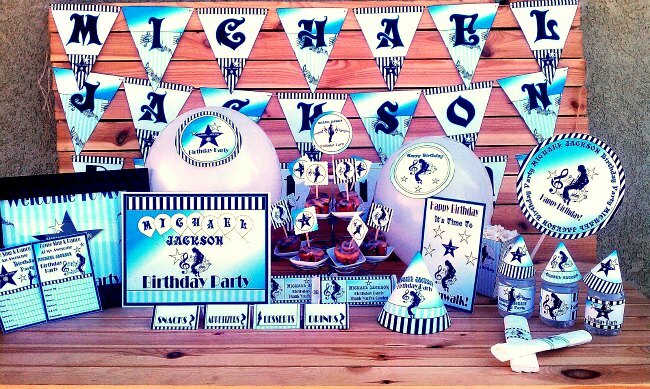 Cool inspired By M. J. printable party supplies themed decor for a musically sensational birthday celebration. Cool inspired By the King of Pop. 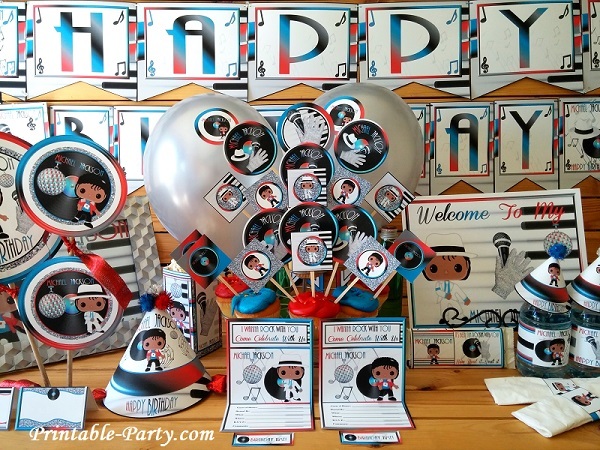 Cool printable party supplies themed for a musically sensational birthday celebration. 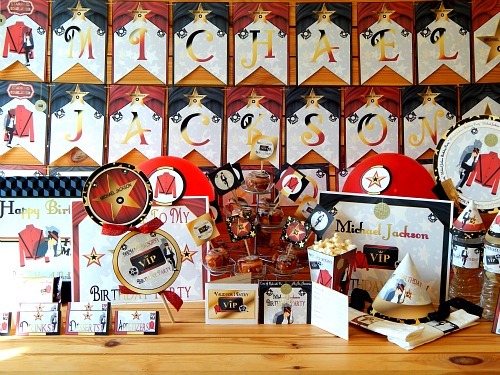 This theme is bright and colorful with stars, records, M.J. silhouettes, microphones, & sparkly gloves sprinkled throughout. Colors are blasted with black, red, yellow, and orange. Embellished with a cool black Hollywood walk of fame star. 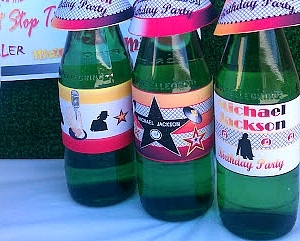 Choose this party pack to enjoy the feeling of having the king of pop infused in your next or up and coming birthday party. 5.x8 letters that read (Micheal Jackson). 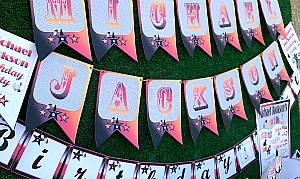 4 Inch letters that say (birthday party). 3 Bonus 4 inch signs. Hats - 2 designs in standard size. 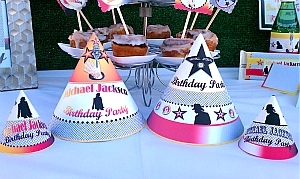 Includes 2 designs of bonus mini hats to use as bottle toppers or party decor. 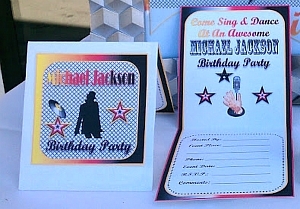 Write in centerfold invites & 2 small signs to be placed on the front of folded invites. Hand write in your details or add them digitally. 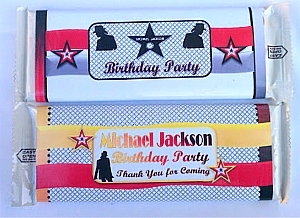 Printable party favor candy bar wrappers in two designs. All you need is your favorite type of Hershey's candy bars, scissors, & glue. 3 bottle label designs per printed page. To be trimmed and wrapped around personal sized bottled drinks & taped or glued to seal the back flaps together around bottles. 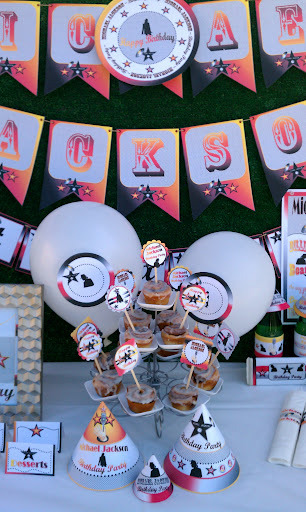 Hang balloons & streamers around party areas & Use matching colored tableware to the printables you are using. 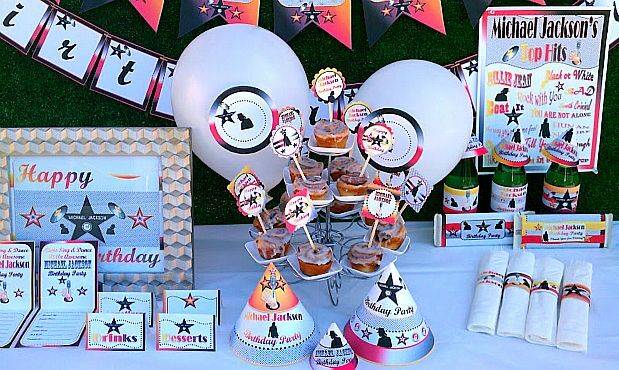 Get a baker or bakery to make an MJ cake , cupcakes, or cookies to match your colors & theme. This This Party Page A Like?